St. Louis encephalitis virus (SLEV) is a mosquito-borne flavivirus that is maintained in a cycle between Culex mosquitoes and birds. Prior to the introduction of West Nile Virus (WNV) to the United States in 1999, SLE was the most common mosquito-transmitted pathogen in the U.S. Two human cases of SLE have been reported in 2014, which are the first human cases identified since 2002. Occasionally, an infected mosquito will bite a human, causing disease. Symptoms appear 5 to 15 days after the bite of an infected mosquito. Most infections are unapparent but when symptoms occur they can range from fever with headache to meningitis, encephalitis, and coma. People over the age of 50 seem to be at greater risk for severe disease. There is currently no therapeutic treatment for SLE. Current methods consist primarily of symptom treatment and supportive care. Many SLE epidemics have been documented in North America. In 1990, there were 223 cases in Florida. Since the introduction of WNV, SLEV activity has decreased dramatically. 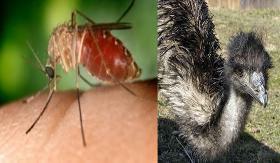 Research has suggested that WNV infection may provide some immunity to SLEV in birds. Fang Y, Reisen W. Previous Infection with West Nile or St. Louis Encephalitis Viruses provides cross protection during reinfection in house finches. Am J Trop Med Hyg. 2006; 75(30): 480-485.